As you begin shopping for televisions, it can be difficult to make a choice. There are so many options, and sometimes there seems to be little difference from one to the other. This is especially true when you start comparing televisions from the same brand. However, making such comparisons can help you a great deal to get the best value and overall product. After all, even the different brands have some variances among their products even when they look very similar. Sometimes the little differences can make a huge difference. So, it helps to compare within brands when you are looking at the different series offered. You can think about a series as being similar to how different car models often have different trim package options. For example, a specific model may have a sports version and a hatchback version. This is how a series works. The main build is the same, but the features are different from series to series. We want to help you out as you try to navigate the differences between the different series from Vizio. Trying to gather information and compare two TVs can be time-consuming. That is why we took two options from Vizio and compared them. We will look at the Vizio P series vs. M series to get you the details on how these two series compare. Next, we will give you an overview of each series, including a short review. Finally, we will end with a comparison and a recommendation on which series would make the best buy. The Vizio P series comes in sizes ranging from 55 inches to 75 inches. They sell for $799.99 to $1,899.99. The TVs in this series are all 4K HDR Smart TVs. They feature Active Full Array Pro, UltraBright 1000 and Ultra Color Spectrum for brilliant image quality. They also have Google Chromecast built-in and run on the SmartCast operating system. This series has a bezel-less screen design. When looking at the picture quality, this series provides you with the ultra HD experience that offers you four times the resolution you get with full HD. This means details are crisper and the viewing experience is of higher quality. The TVs can also upscale content to 4K smoothly. They offer you depth and brightness that excel beyond expectations, giving you deep blacks and bright whites for amazing contrast. The series features up to 120 dimming zones that allow for this detail in the highlights and shadows to sharpen the overall image quality. Not to mention that with over one billion colors, the display is vivid and life-like. Furthermore, picture stabilization helps to remove blurring for a clear picture. The overall smoothness is enhanced thanks to the 240 Hz effective refresh rate. Finally, the octa-core processor delivers fast speeds for a seamless performance. The SmartCast operating system allows you to use Amazon Alexa or Google Assistant to control the TV with your voice. This OS also has some built-in apps for streaming. For additional apps, you use your smartphone to download the Vizio SmartCast mobile app. From the app, you can download and manage your smart TV. With this series, you can also do more. Some of the additional tasks your TV can handle include the following. 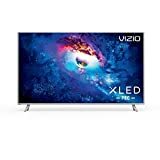 The P series gets fairly good reviews with one glaring issue that you will find across all Vizio series. First, you should know that these TVs do live up to the promises from Vizio for image quality. They handle blacks well and manage contrast nicely. The picture is clear and sharp. The colors are on target as well. Overall, this is a good value because where it falls price-wise, you can get a good deal for your money. This series does stand out as far as dimming. With brands like Samsung and LG, you won't get full-array local dimming unless you are willing to pay a lot for it. With this series, you get it at a good price. It greatly improves the image quality, specifically the black and white handling. With HDR, it improves even more. Add this to the 120 Hz refresh rate for even more excellence in the picture quality. Furthermore, the processing matches those higher-end brands quite well. The smart TV aspect of the P series is lacking. The operating system is not user-friendly. You have to control all smart TV functions using an app you download on your mobile device. You cannot do it on-screen. In fact, the on-screen options are quite limited. In addition, the SmartCast OS is slow and just not as responsive as alternatives. However, since you have five HDMI ports, you can always buy a streaming device to plug in and remove this issue. The Vizio M series comes in sizes ranging from 55 inches to 70 inches. They are marked for sale from $699.99 - $1,299.99. These are 4K HDR Smart TVs. Each features excellent picture quality thanks to technology that includes Active Full Array Plus, UltraBright 600 and Dolby Vision. The smart TV operating system is SmartCast, which is Vizio's own platform. All the TVs also have Google Chromecast built in. They all have a bezel-less screen design. You can expect amazing detail from the M series with clarity that comes from the eight million pixels. When comparing to the 1080p technology, 4K offers four times the resolution. This translates into clearer, sharper images. In addition, the brightness is better, and the contrast with deep blacks is stunning. Even the color looks better and truer. The M series is also able to scale content to 4K from HD and Full HD. The Clear Action 360 feature allows you to get a more stable picture with fewer issues or blurring. The 120 Hz effective refresh rate also adds to the smoothness of the overall picture. Finally, the TV is running on an octa-core processor for ultimate power and precision. The smart TV functions use SmartCast, which is a limited platform for streaming. This can be advanced through downloading the SmartCast mobile app. This app lets you manage your smart TV functions. You can download more apps and customize your experience better. In addition, your smart TV allows you to do these other functions. When it comes to connections, you get enough options to hook up whatever external devices or add-ons that you want. Here are your connection options included in the P series. Overall, the M series offers a nice picture quality at a good price. It is a good value because you get a lot for your money when it comes to the quality of the display. The black handling is done well, producing great contrast. Vizio provides full-array local dimming at much lower price points than its competitors. This means you get more and pay less. The dimming helps a lot with making images sharper and more realistic. The contrast between the shadows of blacks and the highlights of whites is increased for a nice picture that is more pleasing. In addition, it looks better in HDR, and you don't have as many uniformity issues. Now, there are a couple of issues to talk about with this series. First, the refresh rate promised by Vizio in the specifications is not accurate. These TVs have a 60 Hz refresh rate. This can cause some reaction issues and lead to blurry images in scenes with a lot of movement. Another big issue is that the SmartCast platform just isn't easy to use. You need the mobile app if you want to use this TV as a smart TV. Some people won't be happy with this requirement. There are too many other options on the market offering a better smart TV interface that makes it simple to stream. This could be something that causes issues for people who do not subscribe to cable or satellite and rely on streaming services. The best option is to hook up an external streaming device. Before we start talking about the similarities and differences in our comparison of the Vizio P series vs. M Series, let's give you a rundown on the specifications for each. To begin, the sizes of both series are pretty comparable. You can get the P series up to 75 inches whereas the M series is only offered up to 70 inches. Five inches may not seem like a huge difference, and it may not be to some people, but to many, that five inches will be a deciding factor. So, it is worth keeping in mind. You should think about your space and whether the extra five inches would even fit if you are thinking about choosing the P series just because you can get a bigger sized set. Moving to look at the price, you’ll notice the P series sells at a slightly higher price point, but you will soon learn why that is. It is important to note that often pricing directly reflects what a TV can do. It isn't a good idea to make a decision on price alone. You could pass up a better option that would be a better value by just considering the price. Let's dig into the specifications that tell us about how the TVs from these two series function. The main thing you will see is the P series is better than the M series on many points when it comes to overall function. It is a higher-level series and has always been intended to offer something better to consumers. With both series, you get the Active Full Array, but you get the Pro version with the P series and just get the Plus version with the M series. Pro is going to be more responsive and deliver better image quality overall. Since the whole point of your television is a to find the best viewing experience, this is something to consider heavily. Another example of a slightly better specification is the P series has UltraBright 1000 whereas the M series only has UltraBright 600. This will affect colors. It may not be a huge deal right now as shows and movies may not seem different between the two sets, but as technology advances, it soon will become important. For the longevity of your purchase, keep this in mind. The P series has a 240 Hz refresh rate. The M series has a 120 Hz refresh rate. The refresh rate directly affects how smooth your picture is. When viewing TV shows and movies, you may not realize the difference, but if you play games on your TV, then you should look into this more. The difference is pretty big and could impact your gaming experience. All of these differences add up to a significant difference in the picture quality. Viewing on the P series will have an edge over viewing on the M series. It depends on how much value you put into the overall picture quality. For some people, this is the most important factor. For others, the subtle differences and improvements may not be as huge of a deal. This is especially true if either series would be an upgrade for you. For example, if you have never had a 4K TV, then you will probably think both pictures look amazing. Both series offers decent picture quality overall, but you may notice the P series is better than the M series if you have discerning tastes. If picture quality is very important to you, then this is something to note. It is especially worth noting that there is not a huge price difference between the series, so this could be the main tipping point that leads you to choose the P series over the M series. Beyond the picture quality specifications, the only other difference is in the connections. The P series offers options in the HDMI connections. You get one version 1.4 port and four version 2.0 ports. With the M series, you get four version 2.0 ports. Depending on what you want to connect, this could be an issue, and again, it could play into your final decision. Connections may not seem like a huge deal, but once you start using your television, you will want to be sure it has all the connections you need. It is well worth your time to do some research into what you need before making a final decision. Everything else about these series pretty much lines up evenly. Since they are both from Vizio, you get the brand's smart TV interface, which consumers do not feel is really all that great. Of course, you can always use another interface if you want. If you are looking at Vizio, though, that is something you know going in since all the brand's smart TVs use it. The comparison between the P series and the M series pretty much shows a distinct winner. The P series comes out on top. However, you will pay more for TVs from this series than those from the M series, so it isn't an even playing field when you take that into consideration. Honestly, though, if picture quality is your main focus, it is worth going with the P series, but you still won't do worse if you do buy from the M series because they are also exceptional TVs.